I wrote an article for an online publication called, My Marriage, My Affair and The Hard Lessons Learned. The article has gotten picked-up on other web sites, has provoked a lot of conversation and I even got some nasty insults sent to me as a result. Clearly, it talks about an affair I had in my first marriage (you can call it an emotional affair…you can call it an affair that occurred when I was separated from my husband….whatever…I fell for someone else while I was still married to my husband). There is nothing that will bring out the haters quicker than admitting to infidelity. And there is also no topic I write about that will lead to more private messages in my inbox from women around the world, saying thank you for putting words to my feelings. The one thing they want to wrestle to the ground and understand. I get it. Where there is an affair, there is also great hurt and mistrust that gets created. Plus, it’s something specific and tangible that we can all point to that is now the cause for our sadness or anger or confusion. It’s not (only) about the affair. The affair is a symptom of the problems that existed in your marriage before the infidelity ever occurred. The days, months or even years that go by without a touch, a kiss, or even a kind word. 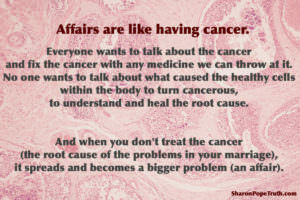 Affairs are like having cancer. Everyone wants to talk about the cancer and fix the cancer with chemo, radiation, and any medicine we can throw at it. No one wants to talk about what caused the healthy cells within the body to turn cancerous, to understand and heal the root cause. And when you don’t treat the cancer (the root cause of the problems in your marriage), it spreads and becomes a bigger problem (an affair). So…..if you’ve had (or are having) an affair, what’s broken in your marriage that needs fixed or tended to? Or if your spouse has had (or is having) an affair, what needs healed or addressed? What is the root cause of the problems in your marriage that led to the affair? That’s worth talking about, don’t you think?